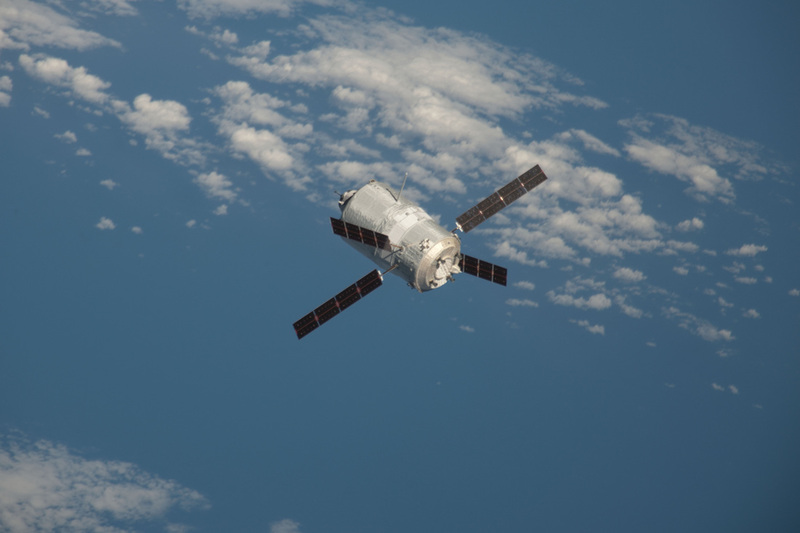 The Automated Transfer Vehicle, ATV, is an expandable, unmanned cargo spacecraft developed and operated by the European Space Agency to resupply the International Space Station. 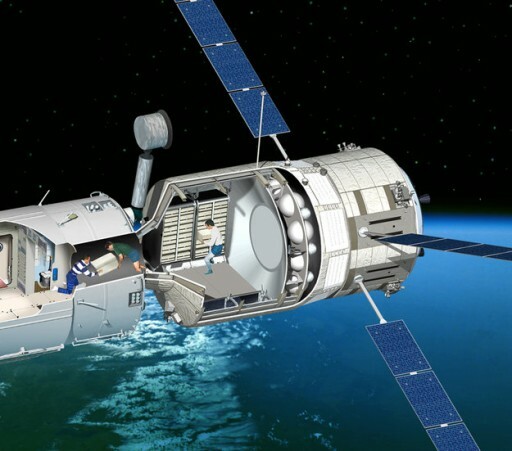 ATV can deliver dry cargo, water, compressed gases and propellant to the space station. Also, ATV is capable of performing ISS reboosts. The Automated Transfer Vehicle can carry a payload of 7,500kg to orbit. The spacecraft is launched on an Ariane 5 ES launch vehicle from French Guiana. It docks to the aft docking port of the Zvezda Service Module and stays docked to the station for up to six months. After undocking, ATV performs a targeted, destructive re-entry over the Pacific Ocean enabling it to dispose trash and no-longer-needed items from the International Space Station. The first ATV, Jules Verne, was launched in March of 2008 and completed a successful six-month flight to the International Space Station. ATVs Johannes Kepler, Edoardo Amaldi, Albert Einstein and Geogres Lemaitre followed in 2011, 2012, 2013 and 2014, performing 4- to 6-month missions. ATV is unmanned, but human-rated as crew members can enter it when it is docked to the Space Station. The ATV spacecraft is cylindrical and is 10.3 meters long and 4.5 meters in diameter with a launch mass of around 20,500 Kilograms. 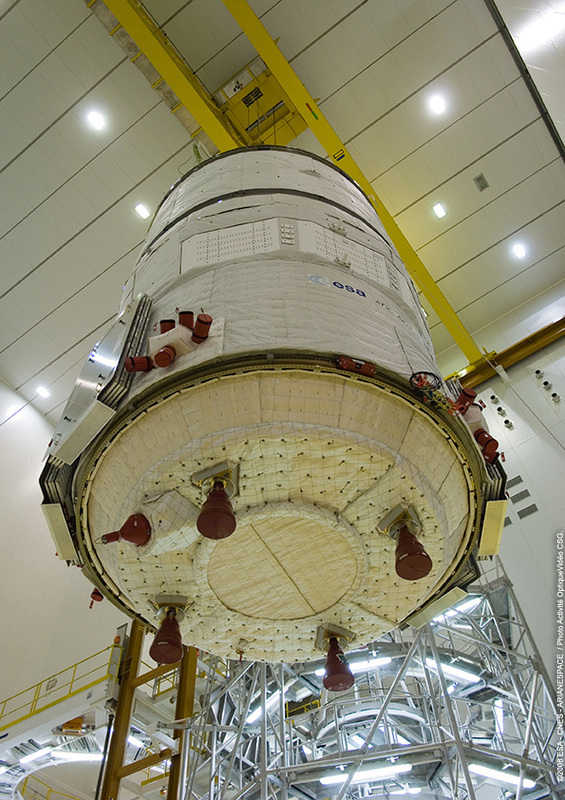 It consists of two modules, the Service Module and the Integrated Cargo Carrier. ATV has a pressurized volume of 48m³ and is the largest ISS resupply vehicle currently flying to the International Space Station. 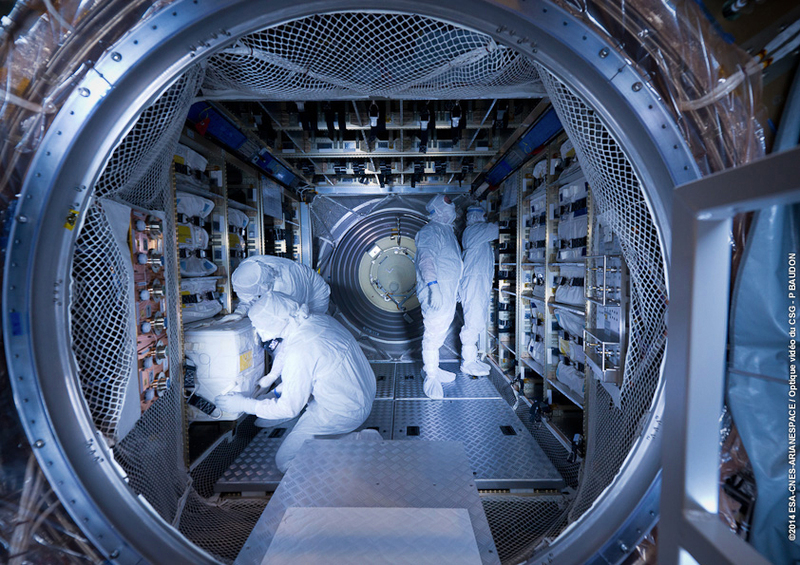 The spacecraft is protected by an insulation blanket that is white in color and an MMOD shield to protect the vehicle from any Orbital Debris and Micrometeoroids. The Integrated Cargo Carrier represents 60% of ATV’s total volume. The module is based on the Italian-built Multi-Purpose Logistics Module that was used by the Space Shuttle to carry pressurized cargo to the Space Station. It is outfitted with accommodations to carry dry cargo and fluid cargo that is carried in two dedicated compartments: the pressurized module that is accessible by the crew and contains the dry cargo, and the non-pressurized part that carries the liquid cargo. In total, ATV can carry 7,500kg of cargo to ISS. This includes 1,500 to 5,500kg of dry cargo, up to 840kg of water, up to 100kg of compressed gases, and up to 830kg of ISS refueling propellant. Additionally, ATV can provide up to 4,700kg of propellants for ISS reboosts during its docked mission. 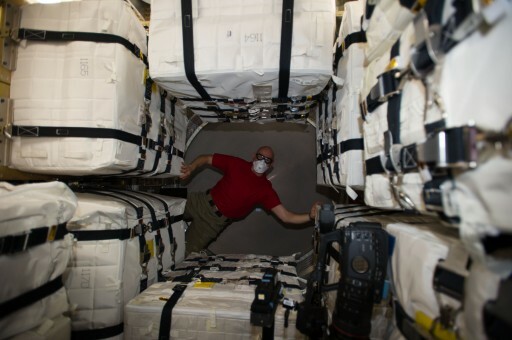 The Integrated Cargo Carrier can facilitate eight standard payload racks which can be used to safely carry cargo bags and other dry cargo to the Space Station. The aft and forward sections of the ATV can also be used to carry cargo to ISS with cargo bags being secured in place with cargo straps. Cargo carried aboard ATV includes every-day-life items like food for the astronauts, personal items, clothes and hygiene equipment as well as maintenance items for the various systems of ISS and science materials for ongoing or new experiments that are conducted aboard the station. The pressurized section features a number of accommodations for manned spaceflight, including fire detection systems, air circulation, temperature sensors and lighting assemblies. Water is transferred by the crew that uses water containers that are filled from ATV’s tanks, controlled through a command panel inside ATV. This command panel is also used to empty the gas tanks. Air, Nitrogen and Oxygen (only two per ATV mission) are released directly into the spacecraft (and ISS) to repressurize the vehicle’s atmosphere. The Integrated Cargo Carrier also features the Rendezvous and Docking System. 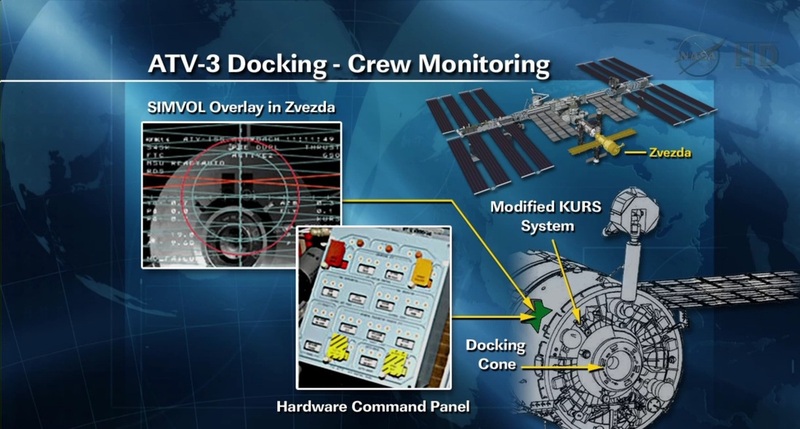 As ATV docks to the Russian Segment of ISS, the spacecraft features a Russian docking system and Rendezvous Navigation equipment, but it also features state-of-the-art rendezvous sensors. ATV has two videometers that process video imagery to compute the distance between the ATV and ISS. Two telegoniometers calculate the relative position of ATV to its docking port and relative velocities. Also, ATV is equipped with absolute and relative GPS systems for the early Rendezvous phase. Star Trackers are used for nominal in-orbit navigation and three-axis-control. Additionally, ATV is equipped with the traditional Russian KURS navigation system that acquires range and velocity data as backup to ATV’s systems. 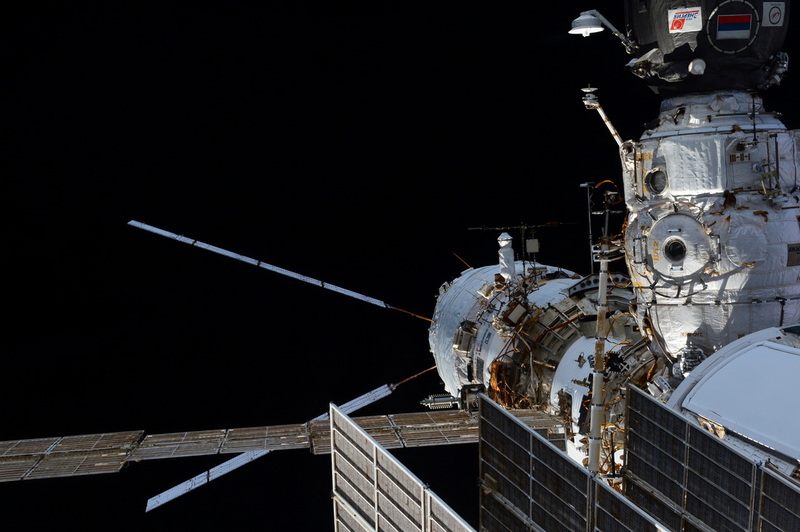 On the forward portion of the spacecraft, the Russian Docking System is located. The docking interface includes electrical and communications systems connectors for power transfer from ISS and communication relay. In addition, the docking interface includes the propellant transfer system. The docking system of the ATV is similar to that of the Soyuz & Progress featuring the classic Probe-and-Drogue approach with ATV carrying the active probe section of the system. The active probe has a capture latch at its tip as well as alignment pins, hooks and shock absorbers. The probe fits right into the drogue on the passive side of the system. After the probe slides into the drogue, the capture latch is activated to hold the spacecraft in place. Shock absorbers are used to dampen out relative motion between the spacecraft while they are soft-docked. Once motion has dampened out, the docking probe retracts to pull the two vehicles together to allow hooks to be closed to form a hard-mate between the structural rings and seals of both sides of the interface. The crew later remove the probe-and-cone docking system to clear the hatchway for cargo transfer operations. The docking interface is rigidized with BZV clamps that are put in place by the crew. The docking system adds a total of 235kg to ATV’s weight. The hatchway between ATV and Zvezda is 80cm in diameter. The service module is located at the rear of the ATV spacecraft and contains all systems needed to support the mission of the spacecraft. Systems located in this section of the spacecraft include the Electrical Power System, Propulsion Subsystem, communication systems and avionics. The upper part of the Service Module is a cylindrical ring, 1.36 meters high, called the Avionics Bay that houses the flight computers and the bulk of the spacecraft’s electronics. 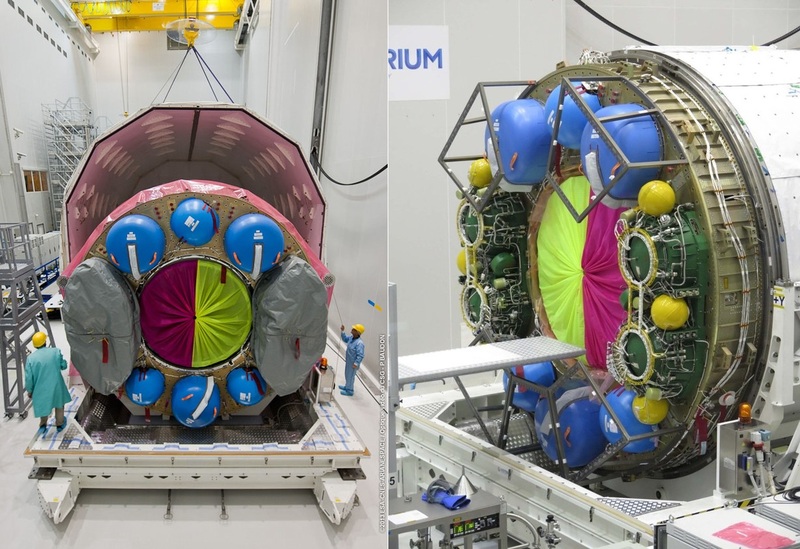 On its other end, the Service Module provides attachment interfaces that can facilitate the ATV Payload Adapter that is used to attach the spacecraft to the Ariane 5 launcher. It is jettisoned 70 minutes after launch. Four solar arrays that are X-shaped when deployed provide power to the Spacecraft. Each array is completely independent and capable of sun-tracking to increase sun exposure. With solar arrays deployed, ATV has a span of 22.3 meters. Each of the arrays consists of four carbon fibre reinforced plastic sandwich panels featuring silicon-based solar cells. ATV’s solar arrays have a total surface area of 33.6m² (8.4m² per array). On average, the solar arrays provide 4,800 Watts of power to the spacecraft’s systems. It is also used to charge ATV’s onboard batteries that provide power to the vehicle during eclipse. ATV’s batteries include re-chargeable and non-rechargeable batteries. The non-rechargeable batteries are only used when the prime batteries which can be re-charged are empty. The Automated Transfer Vehicle features a propulsion system consisting of four main engines and 28 Attitude Control Thrusters. All engines are bi-propellant thrusters using Monomethylhydrazine fuel and Nitrogen Tetroxide oxidizer. The four main engines are R-4D-11 engines manufactured by Aerojet. Each provides 490 Newtons of thrust. R-4D was originally developed as an Attitude Control Thruster for the Apollo Service and Lunar Modules. The engine in its different versions is also used on a number of satellites as an apogee motor. The engine has a dry weight of 3.63kg and is 55.4cm in length and has a nozzle diameter of 27.9cm. The engine is fixed and does not provide gimbaling capability. The engine is a pressure-fed thruster with a fuel flow rate of 0.05kg/sec and oxidizer flow rate of 0.09kg/s creating a chamber pressure of 7.45bar. The engine’s nozzle consists of welded coated columbium (niobium) that is radiatively cooled and film-coated. R-4D can perform continuous burns of up to 1 hour. ATV’s four main engines are used for orbit adjustment burns, phasing maneuvers, rendezvous firings as well as ISS reboosts. The engines can be controlled independently. 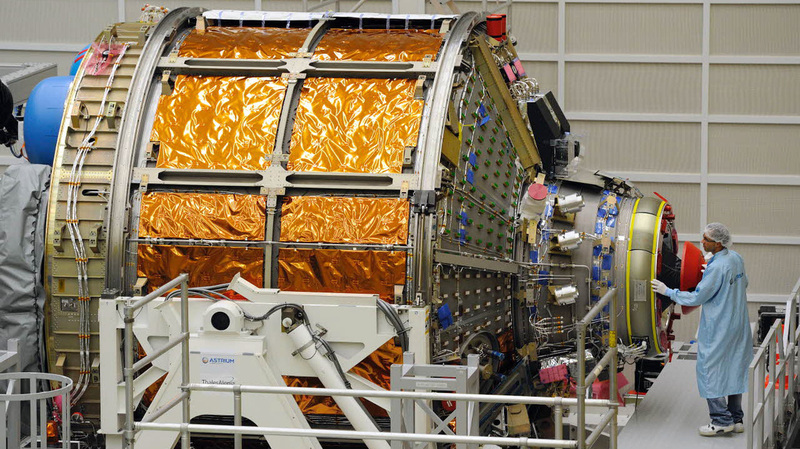 The 28 Attitude Control System thrusters each have a thrust of 220 Newtons and are mounted in clusters. Four clusters of two thrusters are mounted on the forward section of the spacecraft while four clusters of five thrusters are installed on the aft part of the Service Module. The engines are fed from the same propellant system the four main engines receive their propellants from. The engines feature the same injectors that are used on the 490N thrusters. The thrusters can provide impulse burns for attitude maneuvers and small orbit adjustments or braking maneuver, but they can also make continuous burns to serve as a backup to the main propulsion system. The engines operate at an Oxidizer Inlet pressure of 12.9 to 23.9 bar and a fuel inlet pressure of 12.8 to 23.2 bar. The engines can make up to 160,000 pulses during their mission and support a total burn time of 12.9 hours. The ATV’s propellant system is comprised of eight titanium propellant tanks holding 7,000kg of propellants. The tanks are outfitted with insulation material to provide thermal control. 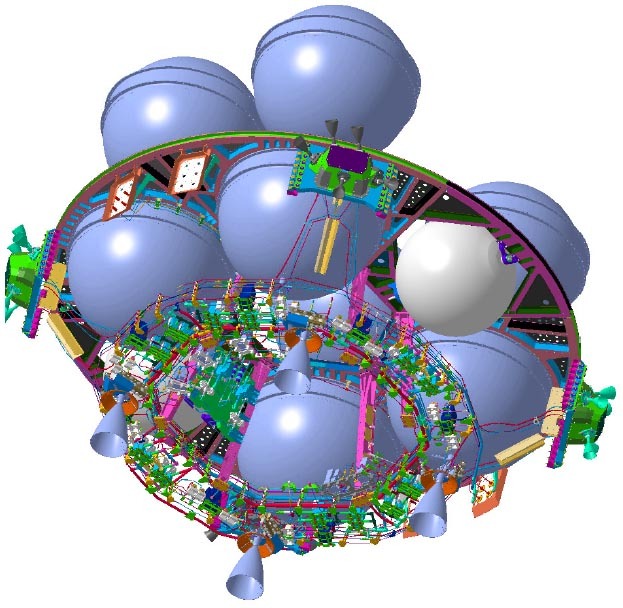 Two spherical high-pressure Helium tanks are used to keep the propulsion system pressurized. The Avionics Bay of the vehicle, or the brain of the ATV, contains computers, gyroscopes, navigation and control systems and communications equipment. The items are installed on a total of ten equipment carrier trays that feature active thermal control systems with a number of heat pipes to keep the equipment at a constant temperature. Additionally, the Service Module houses the communications equipment. ATV can communicate directly with ground stations via an S-Band system. Also, S-Band is used to communicate with NASA Tracking and Data Relay Satellite System to provide global communications coverage. A direct line of communications with ISS is established on S-Band once ATV reaches the vicinity of the station. 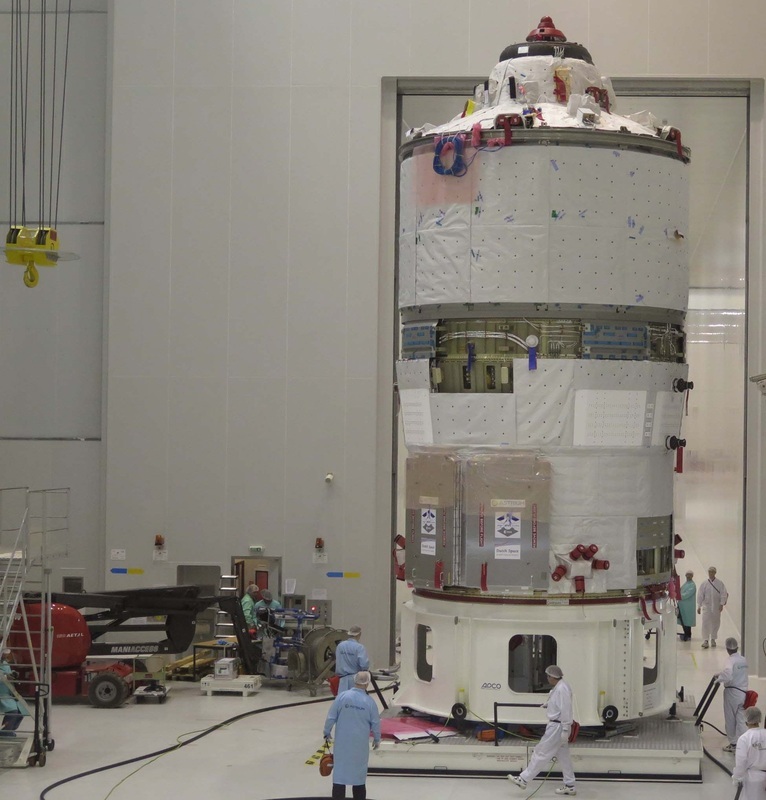 “The ATV Service Module takes advantage of a very sophisticated architecture for its hardware and software in order to keep the ATV functioning in case of hardware failure or main malfunction,” ESA’s ATV over view notes. The mission of the Automated Transfer Vehicle is controlled by an international team of mission controllers. The main control center for ATV operations is located in Toulouse, France. The ATV-CC controls all aspects of ATV’s flight and is in charge of ATV commanding. From launch to re-entry, the center is staffed around the clock as controllers watch over the vehicle’s systems and perform regular testing operations. Mission Control Moscow has the authority over the docking operation as ATV docks to the Russian Segment of the station and uses a Russian docking system. 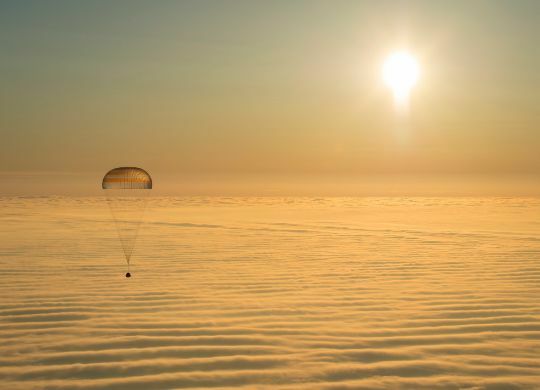 However, ESA personnel is also present in Moscow to provide mission support during Rendezvous and docking and ATV-CC still provides ATV commanding during approach. Also, Moscow is also performing a lot of the joint ISS-ATV operations as they involve transfer of control from the Russian Segment to ATV. Mission Control Houston is responsible for the entire Space Station and coordinates the overall ISS-ATV joint operations. In orbit, an international crew of Astronauts and Cosmonauts is responsible for ATV operations. They monitor ATV during rendezvous and approach and are ready to send commands to the vehicle via the ATV command panel. They perform initial ingress and cargo operations as well as ATV maintenance and clean-ups to keep ATV in good shape over the course of its mission. 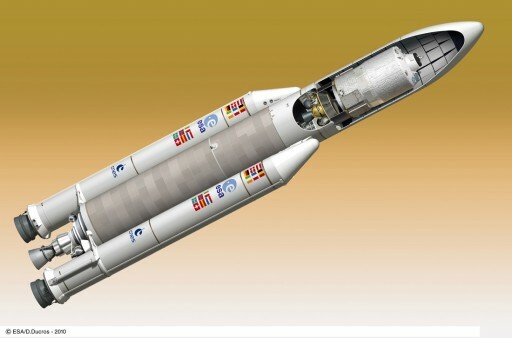 ATV is launched atop an Ariane 5 ES launcher that features a re-startable Upper Stage to deliver ATV to a circular Low Earth Orbit. For that, the Ariane 5 performs a standard ascent phase with its boosters and first stage before making the first Upper Stage Burn to deliver the stack to an elliptical parking orbit. Afterwards, the vehicle enters a coast phase to climb up to Apogee where the EPS Upper Stage performs another short engine burn. About 63 minutes after launch, ATV separates from its Upper Stage to begin its long mission in orbit. At T+70 minutes, ATV separates its Payload Adapter that was used to install it on the launcher. Meanwhile, the EPS performs collision avoidance maneuvers to set the stage for its deorbit maneuver that occurs just over two hours after launch. At T+100 minutes, ATV start its solar array deployment sequence that takes several minutes to fully deploy all four solar arrays and start sun-tracking. 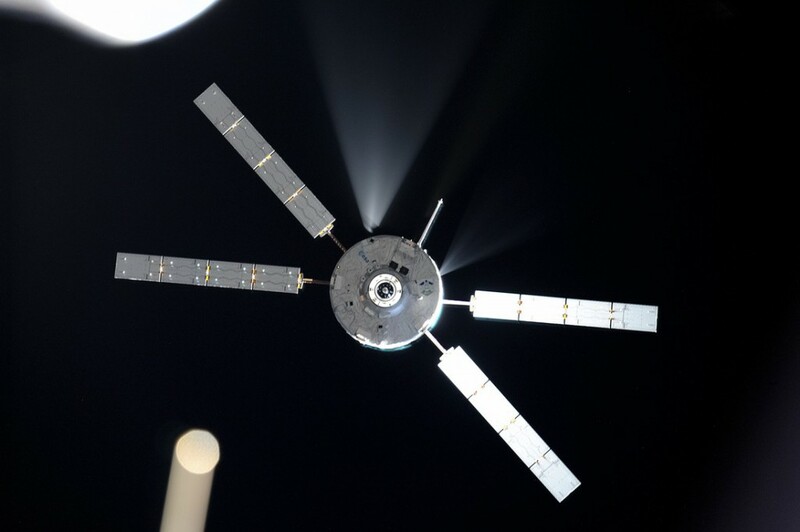 After solar array deployment, orbital insertion is officially complete and ATV begins on-orbit operations as part of its autonomous flight to the space station. Once in its nominal configuration, ATV begins a series of checkouts of all of its systems. Mission Controllers perform tests of all thrusters and monitor all other systems including the interior of the Integrated Cargo Carrier to make sure conditions are favorable for crew ingress once ATV is docked. Over the course of five days in free flight, ATV performs a number of phasing maneuvers and orbit adjustments to raise it altitude and chase the International Space Station to set the stage for Rendezvous. Rendezvous operations start when ATV is 40 Kilometers behind and 5 Kilometers below the station. ATV performs a fully automated Rendezvous and Docking Sequence using its onboard computers and navigation instruments. 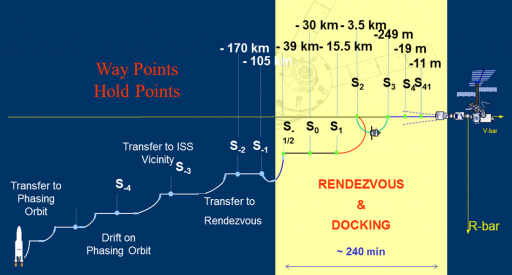 Rendezvous begins about four hours ahead of docking. Once passing the first Waypoint, the vehicle begins a series of four Homing Maneuvers before arriving at the S2 holdpoint, where the vehicle stops its approach for just over 30 minutes to allow teams to assess ATV’s systems and relative position. Before resuming its approach, ATV has to receive a GO command from Mission Control or ISS. From S2 at a range of 3.5 Kilometers to S1 at 249 meters, ATV performs a total of four Closing Maneuvers before stopping its Rendezvous again. At S3, ATV should be lined up with its Zvezda docking port and teams are verifying good navigation data and alignment before allowing ATV to proceed. The S3 hold is also about 30 minutes in duration. Afterwards, ATV proceeds to a distance of only 19 meters which represents the S4 hold point where the approach stops for 20 minutes. Teams make a final assessment of all systems and alignment before starting the final approach. At 11 meters, the S4-1 Holdpoint is available to teams should any problem occur, but in case of a nominal Rendezvous, ATV coasts through that hold and slowly approaches the docking port at a relative velocity of just 0.1 meters per second. Once contact and capture has occurred and ATV is soft-docked, teams wait several minutes to allow relative motion between the vehicles to dampen out before retracting the docking probe and starting to close hooks and latches to form a hard mate. When a hard mate is established, the vestibule between ATV and ISS is pressurized for an extended period of leak checks. Also, electrical connectors are secured and communication interfaces are tested to make sure ATV can receive power from ISS and communicate with the station’s computers for nominal docked operations. When leak checks are complete, the crew can open the hatch an complete initial ATV ingress. As with every visiting vehicle, initial ingress is performed by crew members wearing protective gear in case the atmosphere inside ATV presents any hazards. After a visual inspection and air sampling, crew members egress the vehicle and put an air scrubber into the module. When the scrubber was active for some time and ground controllers have no concerns, ATV’s hatch can be opened for good to allow it to become a part of the space station for six months. Over the course of these six months, the crew members remove all delivered cargo items from the vehicle and transfer water that was delivered. The crew also manually performs ISS repressurizations from ATV’s gas tanks. In addition, ATV is used for temporary storage while it is docked. Towards the end of the docked mission, crew members fill the vehicle with trash and no-longer-needed items for disposal. Over the course of its docked mission, ATV is in charge of ISS attitude control, especially during maneuvers. The spacecraft also performs a number of Reboosts and ATV is available for Debris Avoidance Maneuvers. 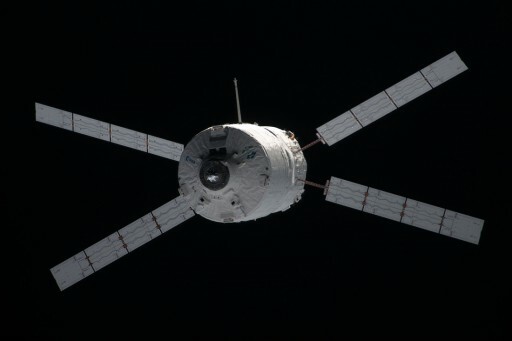 Once its docked mission is complete, ATV’s hatch is closed and leak checks are repeated before ATV bids farewell and undocks from the Service Module. 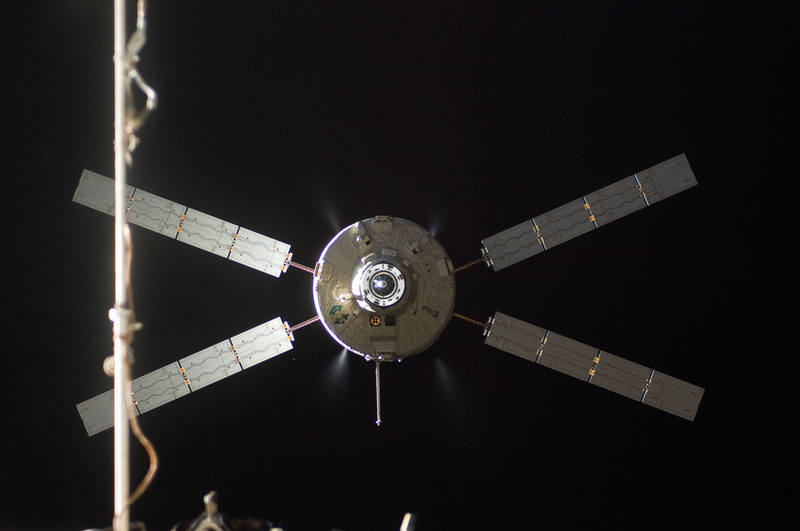 The spacecraft makes a number of departure burns and enters a lower orbit than ISS. Usually, ATV performs its deorbit maneuver after about 24 hours of free flight. 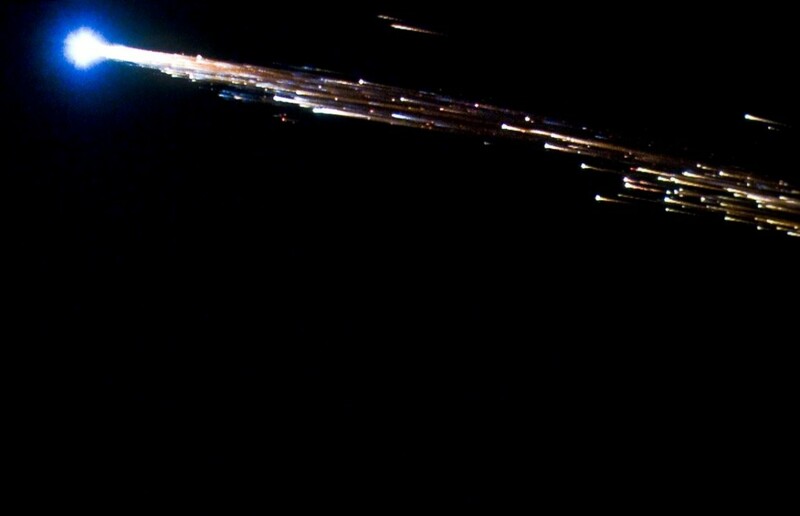 ATV’s final maneuver consists of two engine burns that place the spacecraft on a trajectory to re-enter the atmosphere. As ATV is not outfitted with a heat shield, the vehicle breaks up during entry and burns up to a large extent with surviving debris impacting in the Pacific – far away from any populated land masses. “The REBR is designed to be released from the reentering host vehicle during the breakup process, to fly free and reach a subsonic, free-fall velocity at about 18 km altitude, from where it will make an Iridium satellite call to ‘phone home’ its recorded data before it, too, impacts the Earth. 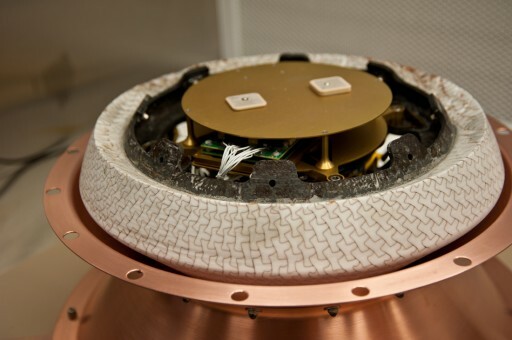 Recovery of the device is not required,” said ESA’s Charlotte Beskow, Deputy ATV Programme Head. REBRs have flown on several previous ATV and HTV Missions. Data acquired by Re-Entry Data Recorders can be used to improve future space vehicle design, satellite reentry predictions and space debris.